Happy Tolkien Week everyone! Tolkien Week celebrates the life and works of John Ronald Reuel Tolkien. September 22, which occurs during the week, is commonly celebrated as the birthday shared by Bilbo and Frodo Baggins, lead characters of The Hobbit and The Lord of the Rings respectively. Also, The Hobbit was published on September 21, the day before Bilbo and Frodo's shared birthday. J.R.R. Tolkien was actually born on January 3, 1892, and died on September 3, 1973. Why did Tolkien choose September 22 then? Writings from Tolkien on the matter are nonexistent, but fans of the series have come up with many theories. September 22 is around the day of the Autumn Equinox; although the day changes year to year based on the axial tilt, and the Earth's rotation and revolution. Autumn is often referenced as the time when shadows lengthen and the world grows colder... much as it does in the Lord of the Rings, when Sauron learns his ring was found by a hobbit in the Shire! Interestingly enough, fans and scholars also point out that March 25, the supposed day that Sauron was defeated, marks the Spring Equinox, when the world returns to life, days grow longer and warmer, and many cultures host festivals and rites celebrating the renewed growth. Tolkien, a very well-educated scholar in his day, likely knew of this and intentionally wrote in the symbolism. And as for The Hobbit? 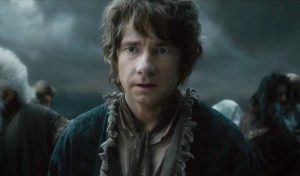 Bilbo's birthday barely gets mentioned at all, save that he knew it happened, but he was too busy to dwell on it. Alas! -Reading your favorite Tolkien work. -Reading ALL of Tolkien's works! -Watching one or all of the movies! -Going barefoot like a hobbit for a day. -Enjoying the various meals of a hobbit, such as 'second breakfast', lunch, dinner, AND supper, among others. Yes, interestingly enough, hobbits give out gifts on their birthdays, rather than receive them. So kick back, relax, and enjoy some time with one of literature's greatest works of fantasy. 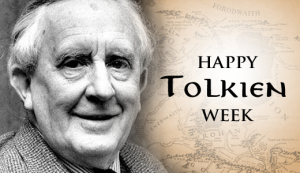 Feel free to leave a comment about how you are planning to spend Tolkien Week!